Generally, protective measures include providing sufficient concrete temperatures as mixed, not placing concrete on frozen base material or subgrade, and not allowing concrete to freeze before reaching 500 psi, generally at least 48 hours from time of placement. 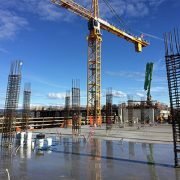 Heated aggregates and/or hot mixing water are often used by ready mixed concrete companies to achieve required minimum as-delivered concrete temperatures. Heated enclosures and curing blankets are often used to maintain concrete above freezing temperatures in the field once placed. Care should always be taken to vent the exhaust of hydrocarbon-burning heaters outdoors if they are used due to the risk of death of workers and carbonation of the concrete surface. The damage from early-age freezing of concrete is often readily identifiable upon visual inspection due to the formation of ice “lenses” in the concrete surface. 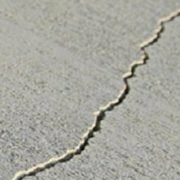 Concrete that has frozen during its early age (during the protection period) often will never achieve required compressive strength or durability characteristics. Concrete hydration is an exothermic reaction. However, the rate at which the heat is lost to the atmosphere can overcome concrete’s ability to replenish the heat in the absence of insulating materials. ACI 306R gives recommendations on minimum temperatures to resist damage from early-age freezing based on cement content, concrete member thickness, and insulation R-value employed. (*) Concrete below 50 F (10 C) may have extended set times beyond what is expected. Various techniques are used by concrete companies to offset the effects of low concrete temperature, including heating aggregates, heating water, and the use of chemical accelerators. Spray-Lock Concrete Protection (SCP) products should be kept from freezing during storage and should not be applied to concrete with temperatures less than 40° F (4.4° C). When chemical accelerators are used in the concrete, care should be taken when using SCP products due to early setting of the product on the surface after application. If this occurs, delay SCP product application until the product penetrates without reacting on the surface. Otherwise, SCP products can be expected to perform normally as long as cold weather concreting procedures are in place. Quality concrete construction is achievable in cold weather, but takes careful preparation, planning, and execution. 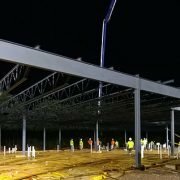 Generally, producers and contractors that operate in cold weather often are accustomed to the requirements of cold weather construction. Problems typically occur more often in warmer regions that rarely have cold weather for extended periods where cold weather concreting procedures are rarely used. ¹ ACI 306R-16 Guide to Cold Weather Concreting. American Concrete Institute, Farmington Hills, MI.